Earlier today, we reported that Netflix decided to use today's Inauguration Day festivities to release the first trailer for House of Cards Season 5. They weren't the only TV show to address the day's events in the nation's capitol, where Donald Trump was sworn in as the 45th President of the United States. The hit Comedy Central series Broad City took a much different approach, with a new video that shows how creators/stars Abbi Jacobson and Ilana Glazer reacted just minutes before the Inauguration ceremony took place. 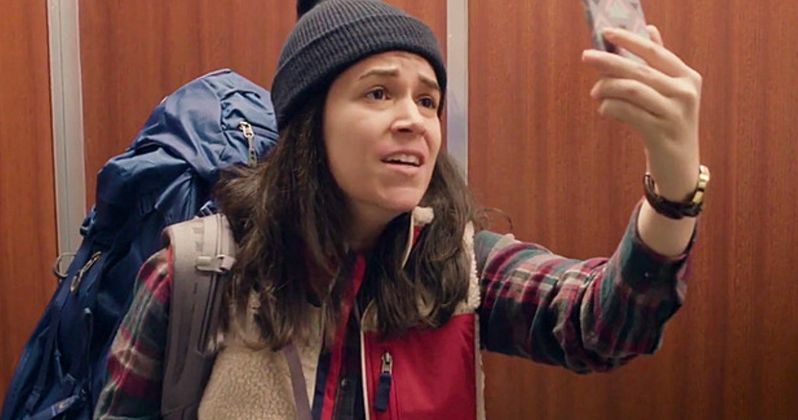 This new video debuted on the Comedy Central YouTube channel, which starts with Abbi Jacobson stuck in an elevator, just moments before Donald Trump took the highest office in the land. After struggling to find a signal, she finally puts in a face time call with Ilana Glazer, where Ilana chides her for going into any sort of a 'big building' on Inauguration Day, claiming that it will "get I Am Legend in here," just after Trump is sworn in. Abbi reveals that she went to this building to finish the last visit of a pre-paid laser hair removal package, although Ilana believes that, under this new regime, "mustaches will be currency soon." What's interesting is any time Donald Trump's name is said or even shown on a cell phone screen, the words are bleeped out as if they were curse words. This is quite ironic since this video is actually uncensored, with a few "F-bombs" being dropped, while they don't even state the new President's name. Perhaps they're treating him like Lord Voldemort from Harry Potter, subscribing to the notion that the more his name is said/written, the more power he has. That's just speculation, but it's still interesting that there is no shortage of R-rated language, while censoring Donald Trump's name. When the countdown towards Trump's inauguration comes to an end, the ladies equip themselves with mace and butterfly knives, although when the countdown ends, nothing severe happens. In fact, Abbi's elevator turns back on, while Ilana realizes that they're shooting an episode of Law & Order: Special Victims Unit right outside her New York apartment, which has never happened before. After going on a brief tirade about all of Trump's controversies, Ilana stops by saying that it isn't even funny because he's mentally ill, and it's just sad. This video could be just a small taste of what's to come this summer. Back in January, Comedy Central renewed Broad City for a fourth and fifth season, with the fourth season debuting at some point this summer, although a premiere date hasn't been given yet. Courtesy of the collective brains of and starring Abbi Jacobson and Ilana Glazer, Broad City is an odd couple comedy about two best friends navigating their twenties in New York City whose adventures always lead down unexpected and outlandish paths. They're broke, flawed and don't shy away from the sticky situations NYC throws at them, they dive right into the muck. But no matter how bad it gets, these young broads are always down with whatever hits them. Joining Jacobson and Glazer as series regulars are Hannibal Buress, Arturo Castro, Paul Downs, John Gemberling and Chris Gethard. Take a look at this new video from Broad City stars Abbi Jacobson and Ilana Glazer.